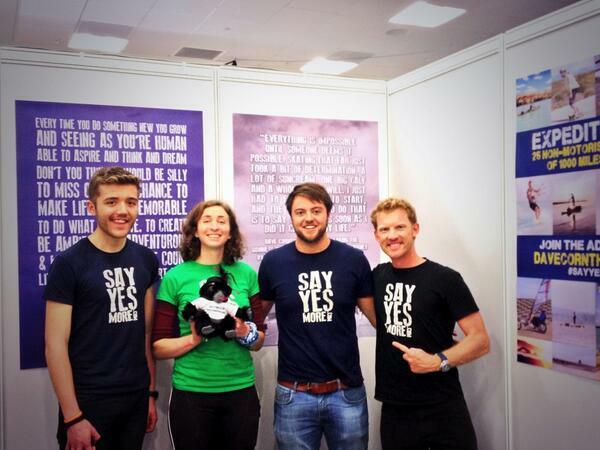 I spent last weekend at the Adventure Travel Show in London, helping out on Dave Cornthwaite’s Say Yes More stand. Everyone on the stand – Luke, Louis, and Dave himself – was lovely, and the atmosphere there was a great mixture of relaxed and proactive. Dave Cornthwaite has hit on a project that I’m pretty envious of – he is part of the way through undertaking 25 journeys using non-motorised transport of at least 1,000 miles each. He is also the founder of Say Yes More – like it says on the box: live life with passion and a positive attitude. I chatted to a lot of different people over the two days, and was pretty chuffed to catch Sir Ranulph Fiennes speaking – I don’t think I’ve ever heard so many crazy and difficult experiences packed into one hour before! 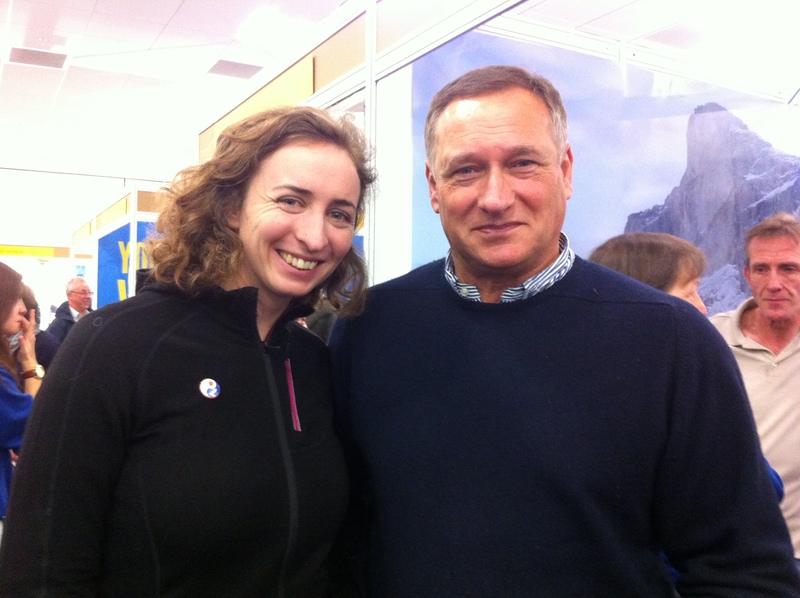 I was also excited to meet explorer David Hempleman Adams – by a strange coincidence I had just been listening to his Desert Island Discs a couple of days before, and it felt slightly unreal to then be meeting him in person so soon. It’s been a long time coming, but we finally have a video about the row – my preparations for it and the cause that I’m rowing for. Hopefully this will make it more real for everyone. I’m really excited about it, and want to say a big thanks to Guthrie Freeman for all the filming and editing – there would be no video without him. Please do watch and share as widely as possible. 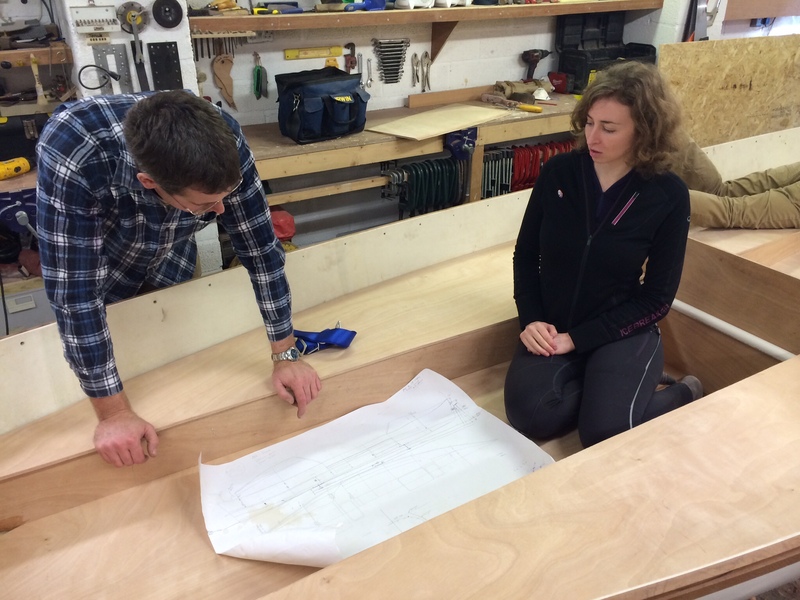 Last Wednesday Steve and I went down to see how my boat is getting on, and to chat to Justin about some of the details. It was a brilliant day, and seeing the boat makes it all that much more real. 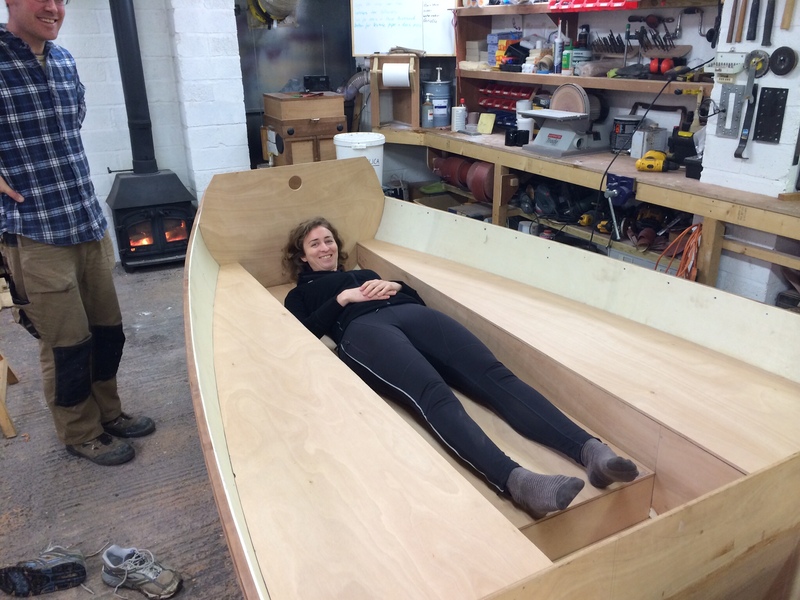 It has pride of place in Justin’s workshop, and looks beautiful (I think the boat is probably an ‘it’ until it is ready and has been launched, when it will become a she). I sat in it, imagining that I was alone on the waves, far away from anyone. The boat feels quite big to sit in, but will definitely feel tiny out on the big ocean. 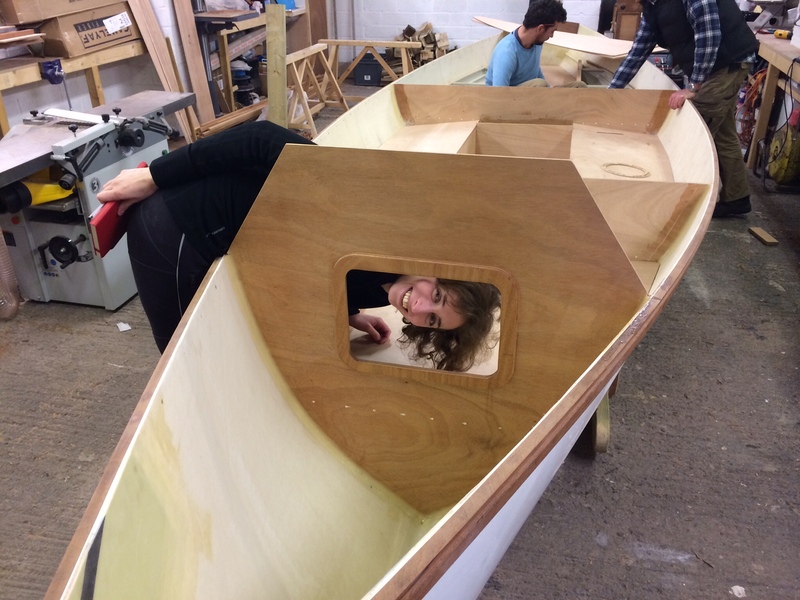 It is similar to other ocean rowing boats that Justin has built, but with improvements and adaptations. There is a space for the anchor to live right in the stern, and my sleeping space is slightly indented, meaning that I will be more snug and will not roll around so much. It also means that the hatches on each side of my bed are a little deeper than usual (more space for snacks! ), and I can use them a bit more like shelves and a desk. 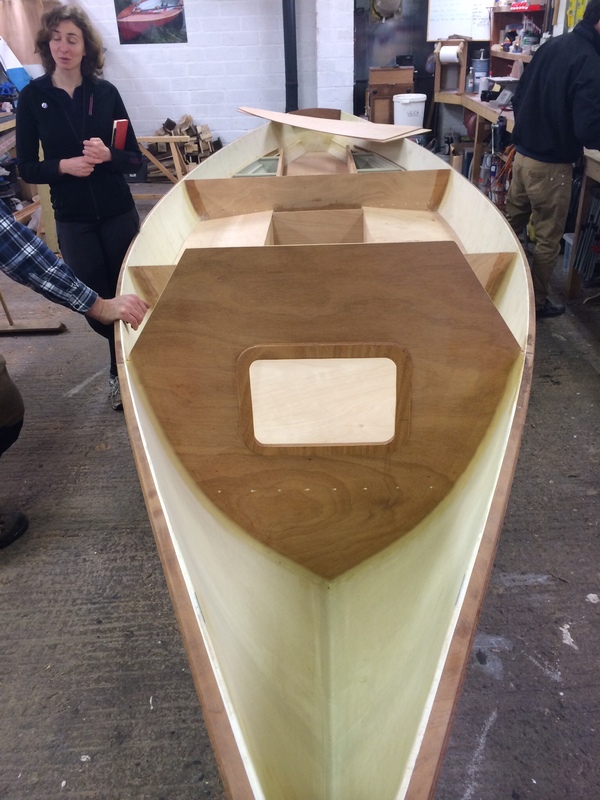 Justin and Will are working hard on getting the boat ready in time for the end of February, so each time I see it there will have been a lot of changes. It’s only a matter of weeks until I’m rowing it.